Okay. I admit it. I really like SPAM. Short for Shoulder Pork and Ham, SPAM was introduced to me as 'luncheon meat'. I fondly remember having fried, sliced luncheon meat on rice, with stir fried vegetables and sambal chilli on the side. It was a typical weekday after-school lunch that was amazingly comforting. So when my challenge theme for this month was "Guilty Pleasures: Recipes Inspired By Cheez Whiz, Spam, Twinkies and Their Delicious Cousins", I knew that I wanted to make another comforting meal, that's maybe just a tad less guilty than my fond memories of SPAM. Let's have a look at their two components: Shoulder pork, and then ham. At about $5/kg, shoulder pork is one of the cheaper cuts of meat, with plenty of connective tissue running through it. Now usually, connective tissue means that this is a tougher cut of meat - hence the lower price. 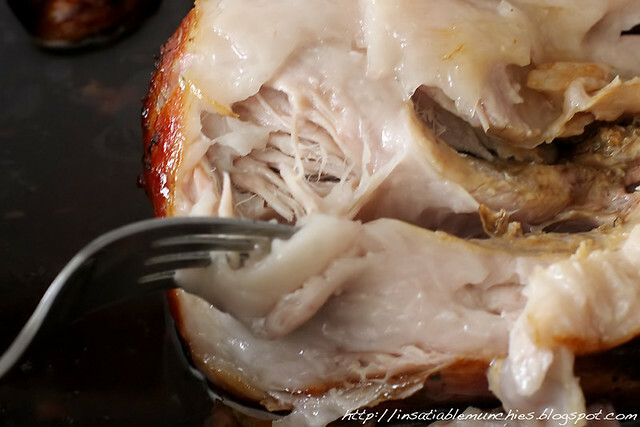 But when cooked low and slow, that connective tissue (collagen) breaks down, and moistens every fibre of meat, making it juicy, tender, and absolutely heavenly. What about the ham bit? Well, rather than using two cuts of meat, I was more inspired by my favourite ham glazes, which usually have maple and honey through it. Maybe a barbecue sauce with maple and honey? Preheat the oven to 220C. Place the spices - I just included what I used, feel free to use whatever you want - in a mortar and pestle with salt and pepper and grind to a powder. Score the rind of the pork with a sharp knife, careful not to cut through to the meat. Rub the rind generously with salt, rubbing into the scores. Turn the shoulder over and pat the ground spices into the meat. Place the meat into a roasting tray - try not to use one that's too big or you'll waste apple juice later on - and put into the middle rack of the oven for about 30 minutes, or until you see the crackling start to happen. Then take the tray out, and spoon out most of the fat. Place the roughly crushed garlic cloves into the bottom of the tray and fill it up halfway with apple juice. Cover it with foil, leaving a tiny corner open for steam to release, and place back into the oven. Turn the oven down to 160C, and roast for about 4 hours, checking every 2 hours or so to make sure that there's enough liquid. The pork is done when you can pull apart the meat easily with a fork. At this time I remove the pork to rest, remove the rind, and place it back into a 180C oven over a rack on a flat tray to finish doing its thang. And the juices from the bottom of the tray? Well I save about a cup of it for the sauce, and reserve the rest to keep the meat sitting moist after I've pulled the shoulder apart. Squeeze out the roasted garlic into the bottom of the saucepan, and add the rest of the ingredients. I like my barbecue sauce on the sweet side, but if you don't, simply add less maple syrup. Cook down the sauce till the desired thickness, and take it off the stove. Shred the cabbage, and finely chop the parsley. Season and mix in with the other ingredients to dress. To finish, tear apart the shoulder by pulling at it with two forks, then place into a bowl and pour over the juices from the pan to keep it moist. 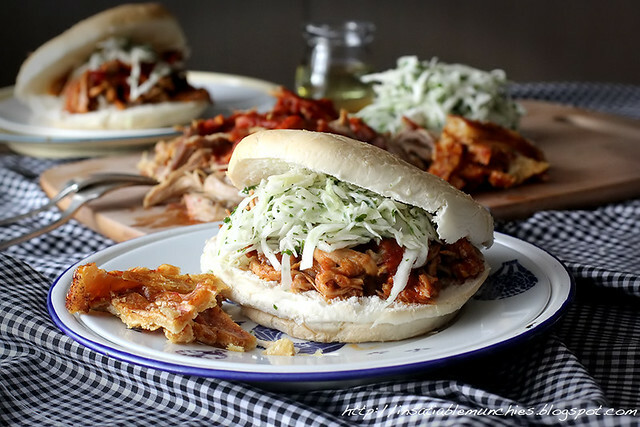 Serve with buns, sauce, slaw, and break up the crackling into 'chips' - I simply cracked it along the score lines. I know it's not exactly the SPAM of my childhood, but it's my take on the comforts of days gone by. How about you? What's your guilty pleasure? I think this is the best recipe you've published so far. And dialing down the maple syrup in the sauce makes it not guilty at all. 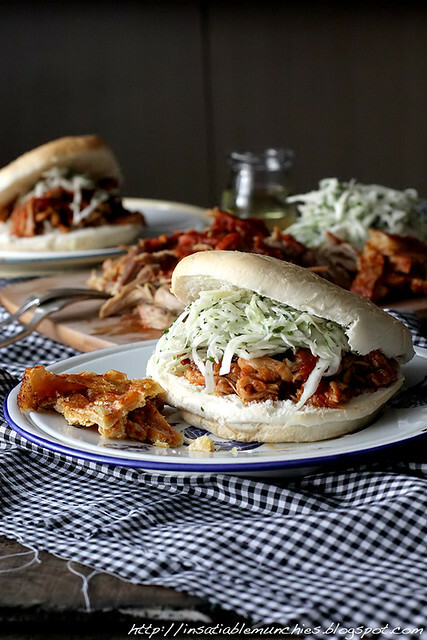 Love the top photo and SPECIALLY the pork shoulder close-up. Oh my goodness, this is so hard to resist. I must make this SPAM version soon. This will be an entree my family will enjoy ! What a fun #LetsLunch event. Glad you shared this and thanks! Looks much nicer than the original SPAM! 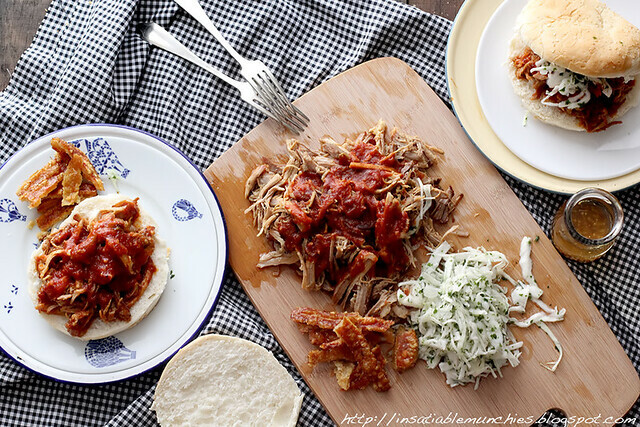 I love pulled pork shoulder in any form and yours looks especially delicious. Welcome to Let's Lunch! I never knew what Spam stood for! This looks lovely. Welcome to #LetsLunch! SPAM was an acronym for something? Well you learn something new every day! Crackling chips sound like the perfect side! Yum! I didn't know SPAM is an abbreviation, just like Tina said haha. O so much better than SPAM. I remember fried SPAM sandwiches. Good stuff. Now it's too high in everything to eat too often..